Are you looking for a durable American flag that will look great but won’t break the bank? The United States Flag Store can help you find the perfect flag that balances durability with economy: our Superknit Polyester Flags last as long as their more expensive nylon counterparts, but are half the price. To name just a few features, these flags feature a thick nylon header that keeps the flag attached to the pole, even in extreme weather conditions. The flags also feature strong brass grommets that won’t rip out under the stress of high speed winds. At the flag end, these banners feature four rows of stitching, compared to the usual two rows, to prevent fraying and promote long lasting wear. Read on to learn more about just a few of the options available at the United States Flag Store’s online store. The 3-foot by 5-foot Superknit Polyester American Flag with Grommets is a great option for indoor or outdoor use. This flag is printed on our specially designed, attractive superknit polyester, that has a silky shine to it. The flag features excellent durability and includes a strong nylon header and brass grommets that make it suitable for outdoor use, even in bad weather. You might see flags like this for over $8 at department or home improvement stores, but at the United States Flag Store, you can order this flag for only $4.10! The 4-foot by 6-foot Superknit Polyester American Flag with Grommets is a great flag for those looking for a larger model, or to order a flag in larger quantities. The flag features all the great qualities as the 3-foot by 5-foot flag, including our signature superknit polyester, durable nylon header, and brass grommets. Order this great flag today for only $9.25, or as low as $7.25 when purchased in larger quantities! 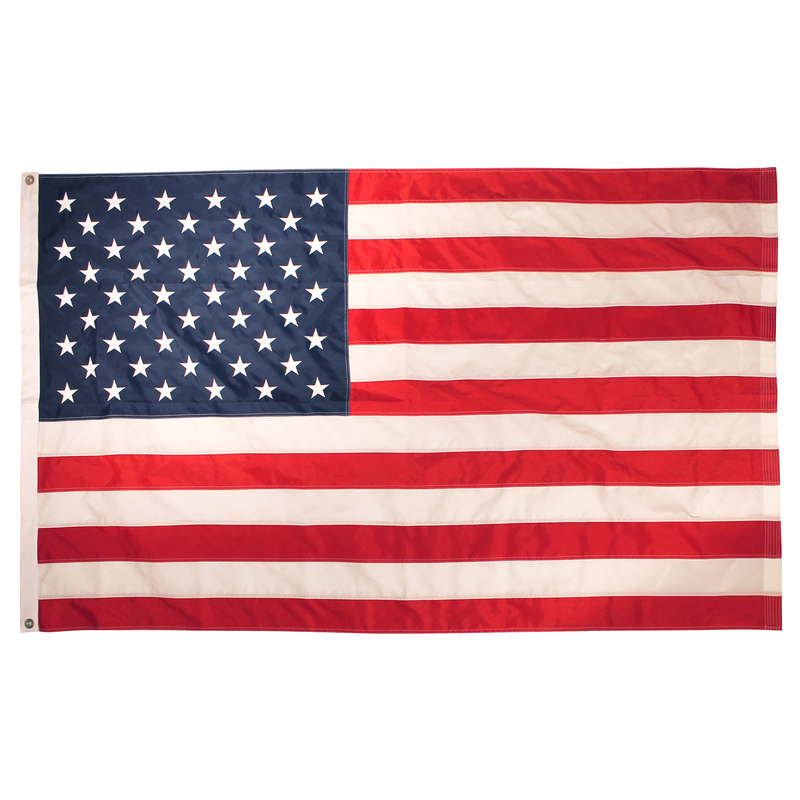 If you’re looking for a great quality American flag at a price you can afford, check out our great selection of nylon American flags, available from our own Online Stores brand. 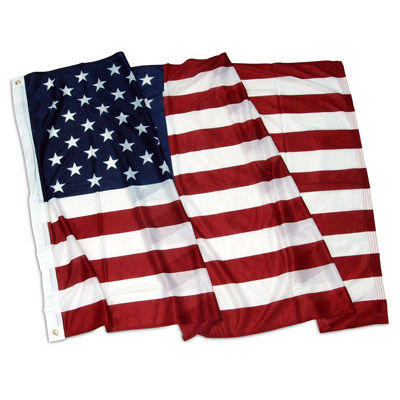 Our nylon flags are made from durable material and have beautifully sewn stripes and bright white embroidered stars. We’re manufactured a high quality flag down to the finer details, too, with a heavy duty canvas heading material, quadruple stitching at the fly end, and rugged brass grommets. These great flags are available at the United States Flag Store’s website at unbeatable prices. Read on to learn more about just a few of the flags in our great selection. The 3-foot by 5-foot Nylon American Flag from Online Stores is our most popular flag, consistently receiving 5-star review from our customers. This flag is made out of durable materials, and will typically last at least one year when displayed outdoors. The flag features beautifully embroidered white stars in the Old Glory field and carefully sewn stripes. Identical in quality to the nylon flags made by Annin and Valley Forge, the flag is fray and fade resistant with four rows of stitching on the fly end and strong brass grommets. You’ll feel proud flying this banner outside your home or workplace knowing that your flag is 100% made in the United States, too. Order one of these flags today for only $15.20, or as low as $13.65 when ordered in larger quantities. If you need a larger flag, check out our 8-foot by 12-foot Sewn Nylon American Flag from Online Stores. This flag is made from durable nylon, and is considered an all-weather American flag for areas with low winds. The flag features beautifully embroidered, bright white stars and sewn stripes. The flag is fray- and fade-resistant and has excellent color fastness. It’s also 100% made in the United States. Order one of these great flags today for only $95.90.